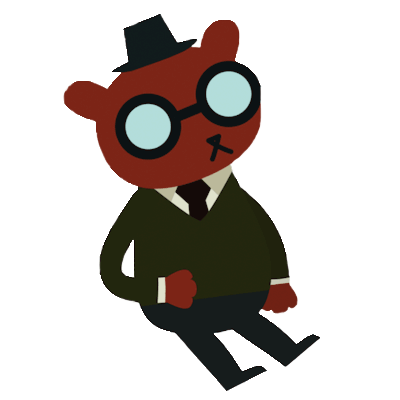 Angus is a bear-like character in the 2017 adventure game Night in the Woods. He works at Possum Springs’ video store, Video Outpost Too. He has a dry sense of humor and puts his faith in science and observable truths. He is in a committed relationship with Gregg, who he credits with “saving” him from his history of familial abuse. Greg and Angus share an apartment together near the center of town. This entry was posted in 2010s, Characters, Games by Decade, Gay, Gay (explicit), Queer Men on January 12, 2018 by Adrienne Shaw.